With Valentine’s Day around the corner, people across Northern Ireland will be searching for romantic ideas to treat their partner. You don’t have to look far this year to find something truly special. 1. Situated on Great Victoria Street in the heart of the city, the 5* Fitzwilliam Hotel is a contemporary design masterpiece with super chic elegance. Relax in your beautiful bedroom (tip: upgrade to a Superior or Deluxe room for floor-to-ceiling windows with views of the city) before making use of the top-class facilities which include a stylish bar known for its copper-clad lighting, cocktails and champagne. 2. For an informal but quality meal, take a five-minute walk from your hotel to Ginger Bistro. Famous for its fish dishes, Ginger is subtly bohemian with a menu which zigzags across the globe. The relaxed atmosphere makes it easy to catch up and enjoy each other’s company. Try the economical pre-theatre menu which includes fresh mussels in a local cider and pearl barley cream with parsley with black beer bread for a starter and a taste bud tingling crab linguini with chilli, lime and rocket main. 3. After your meal, it’s time to stroll back down Great Victoria Street to visit the Grand Opera House. Known as the Northern Ireland’s premier theatre, the GOH delivers an unrivalled programme of entertainment and has played host to some of the greatest names in theatre and music. Book tickets for a show or embark on a tour which gives a unique insight into the people behind the design and early management of the theatre, its rich and colourful history and much more. 4. If you’re still feeling energetic after your evening of entertainment, step into a timeless piece of beauty at the Crown Liquor Saloon. Discover what was once one of the mightiest Victorian gin palaces in the UK and what has now become one of the most unique, traditional pubs with distinctive character. Sample its eclectic range of real ales and, if you’re lucky, cosy up in one of its famous booths. Why not extend the treat into the following day with amazing Afternoon Tea at the Piano Lounge in the Europa Hotel. Sit back in the iconic hotel, unfold your napkins and feast upon delicate pastries, scones and sandwiches served with local charm, all washed down with a glass of sparkles. 5. Belfast Castle estate is situated on the lower slopes of Cave Hill Country Park in north Belfast. Stroll through the scenic parkland and quiet mixed woodland and enjoy superb views of the city from a variety of vantage points. Spot long-eared owls, sparrowhawks and Belfast’s rarest plant, the town hall clock along the way. 6. If you’ve been watching Dancing on Ice, why not take inspiration from the stars and visit Dundonald Ice Bowl, on the outskirts of Belfast. Skate around Northern Ireland’s only Olympic-sized ice rink and put on your best Torvill and Dean impression. 7. Take a dander through Botanic Gardens' vibrant public park which features an extensive rose garden and rare oaks planted in the 1880s. Peruse the Palm House which features all year round displays of colour and scent using plants such as geranium, fuchsia as well as built displays. 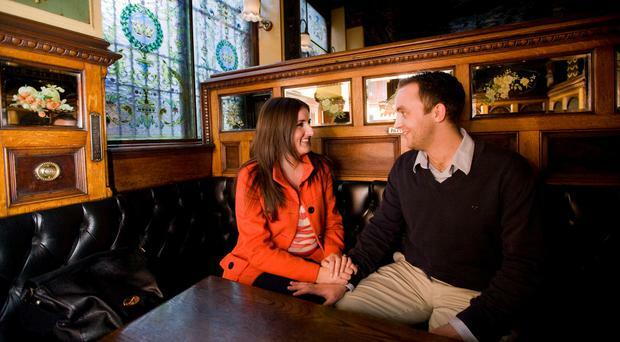 To book your romantic short break in Belfast, visit www.discovernorthernireland.com.